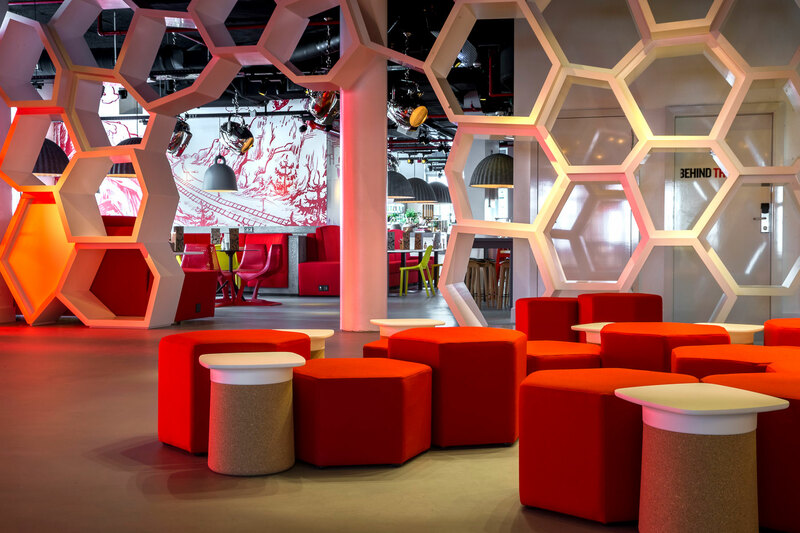 Graven, has been working in collaboration with Radisson Red’s parent company, Carlson Rezidor Hotel Group, for over 14 years. 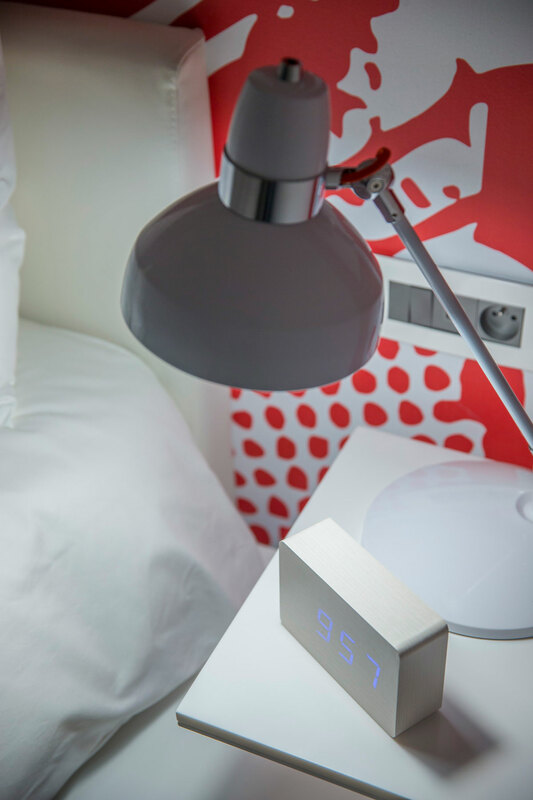 Graven, has developed brand approaches and is delivering new Radisson Red concepts in the USA, Europe, Middle East and Africa. 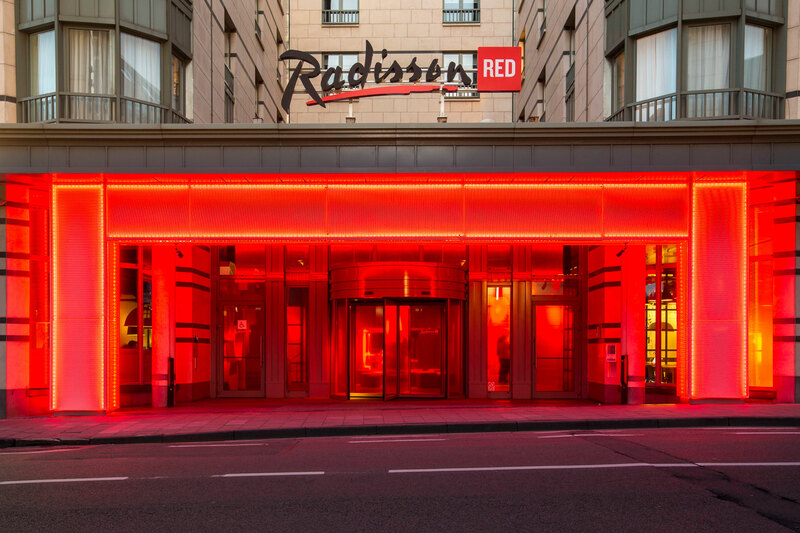 The first Radisson RED to open is in Brussels, with Glasgow and Cape Town following soon afterwards. 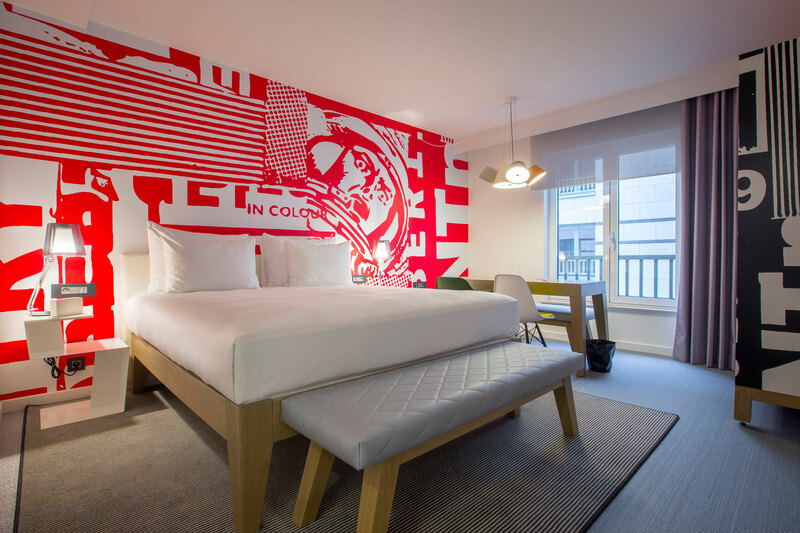 The 149-room Radisson Red Brussels is located in the city centre within walking distance of the European parliament. 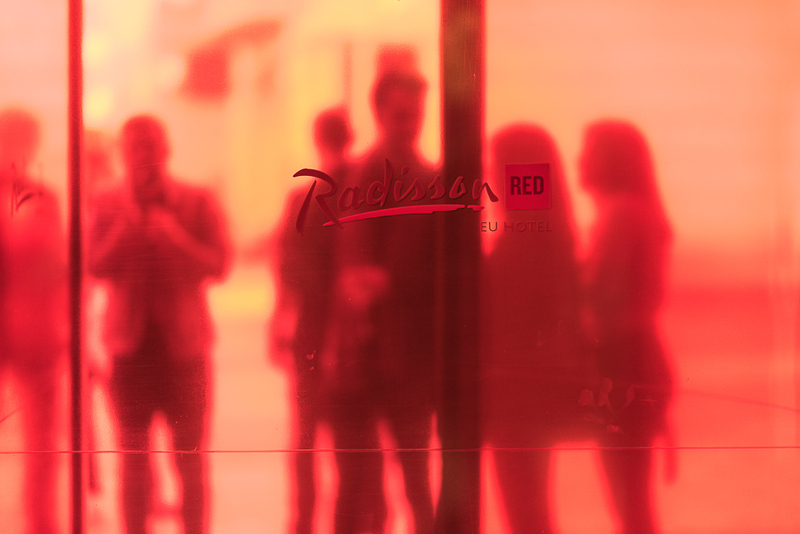 While many hotels clearly delineate between lobby, reception and bar spaces, Radisson RED doesn’t obey any of these fussy conventions, instead reacting against them and opting for seamless, social and multifunctional spaces. 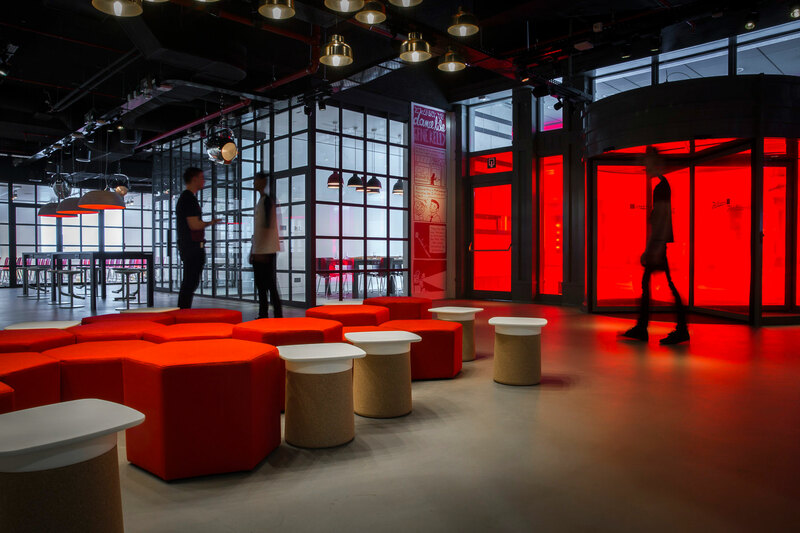 By cutting out many of the stereotypical corporate hotel moves we have tried to make Red a more intuitive experience for guests and a place that genuinely encourages people to occupy all spaces to suit their own personal needs whether that be on business or leisure or both. 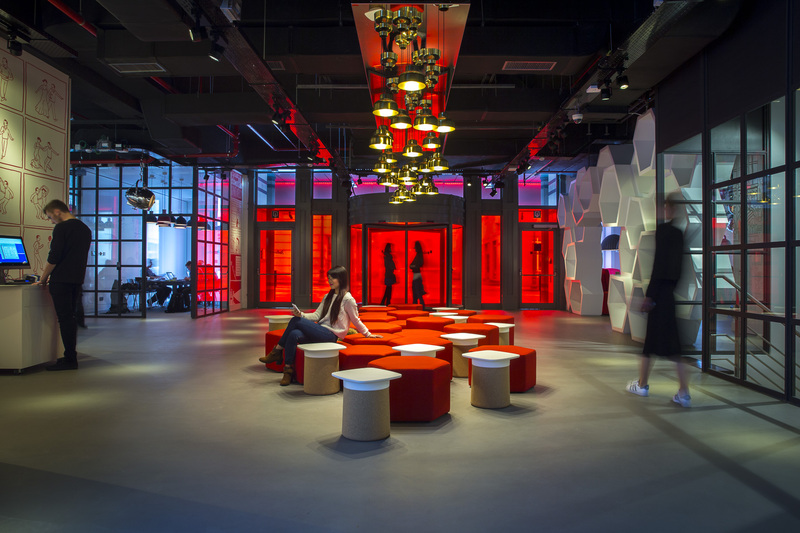 This is a fresh take on the often-tired traditional reception spaces. 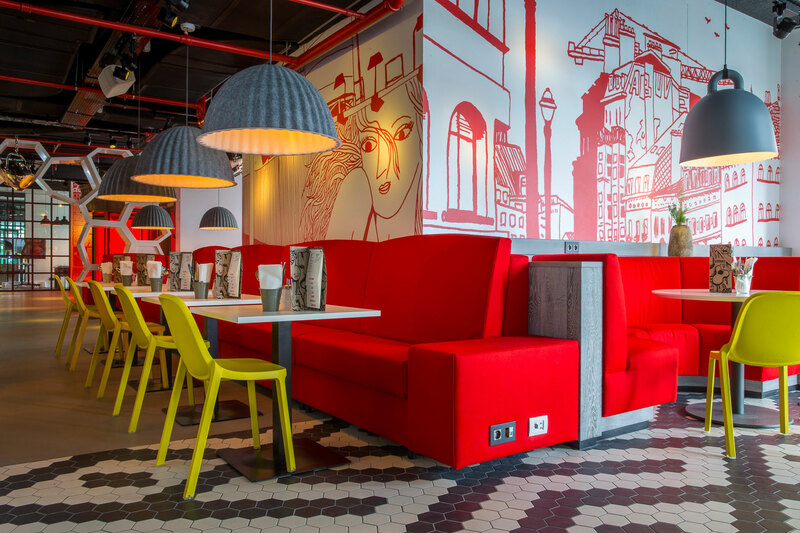 The areas are delineated by a variety of bespoke screens and furniture elements that work together to create an inviting, lively and informal atmosphere. 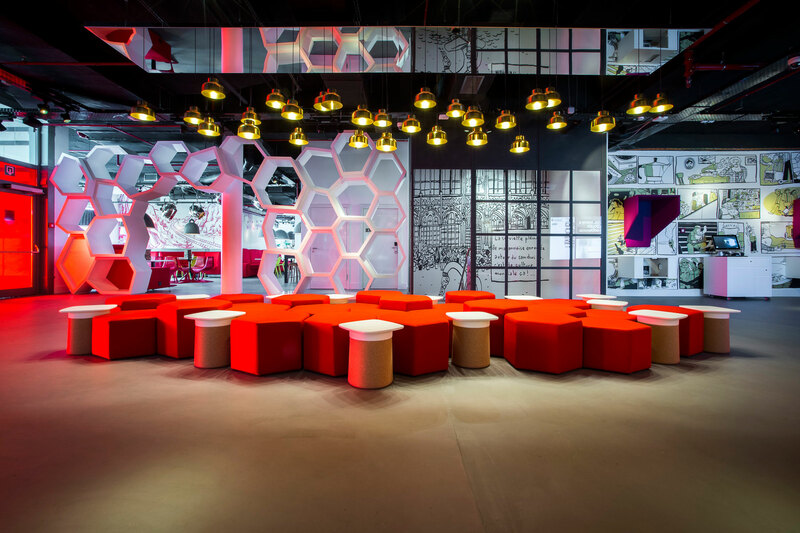 Instead of meeting rooms there are Events & Games Studios, where a daytime board room can be transformed into an entertainment suite with cinema screen and table tennis. 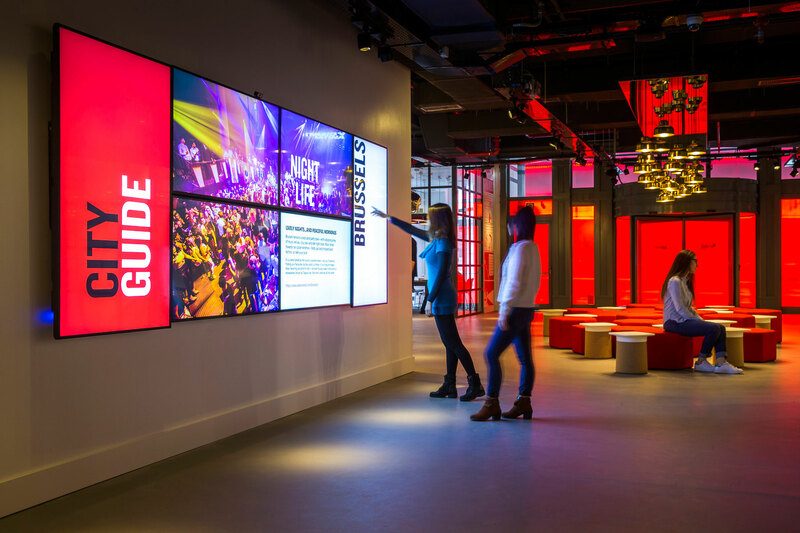 The Events Studios actively engage with the adjacent streetscape and where possible are highly visible to the outside world. Panoramic windows where possible are key to the atmosphere within the Studios with good natural daylight a must. 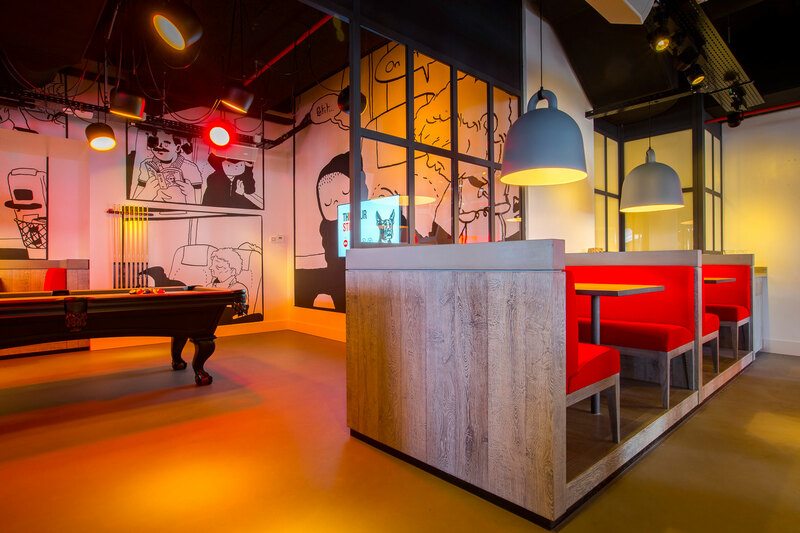 In Brussels, Graven responded to Belgium’s history of comic art and illustration, and collaborated with two local comic book illustrators, Wauter Mannaert and Max De Radigues. 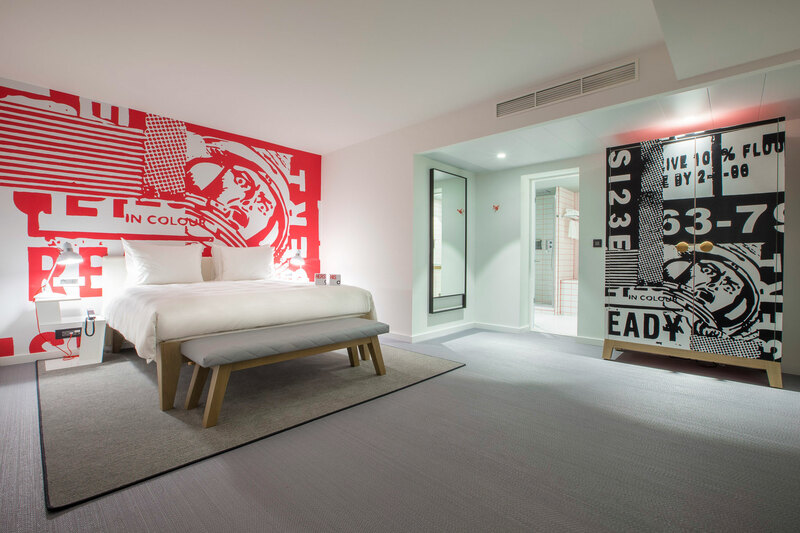 We worked with both artists to create a series of large scale installations that push art way to the fore throughout both public spaces and guest rooms. 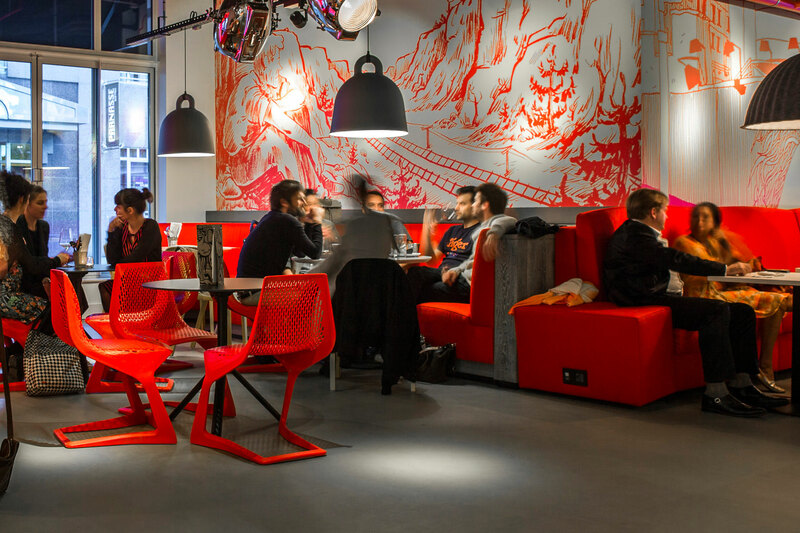 The giant illustrations work as both a medium for setting a social tone as well as making the interiors relevant locally. 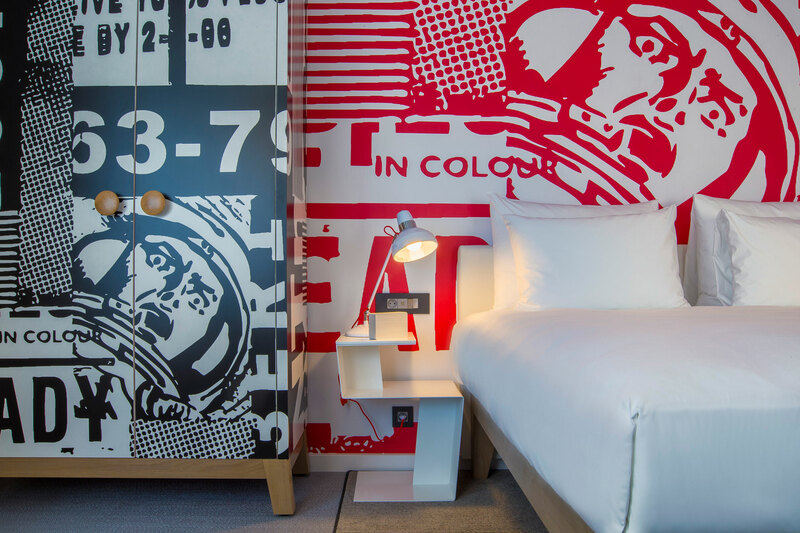 Wauter also produced a series of live art pieces within the hotel in the days leading up to opening which were part of an online social campaign. 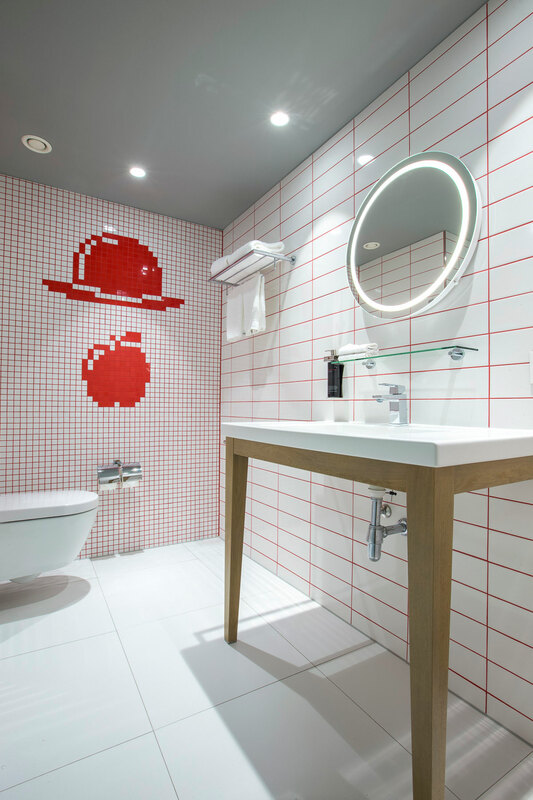 In Red it is key that all hotels are seen to morph with local culture and influences. 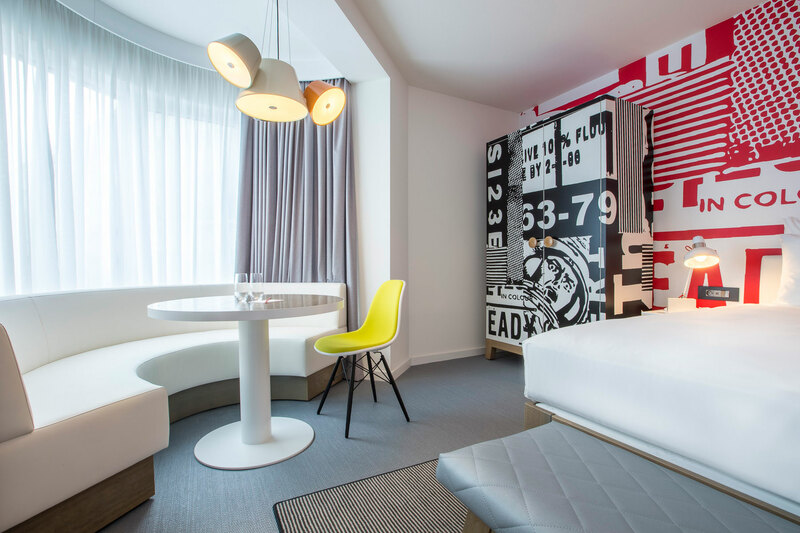 Belgium’s rich history of comic book illustration is a great fit within the hotel and the scale, quality and variety of pieces used throughout is unique.